Recently we called on drum corps fans to "spread the word" about drum corps to the uninitiated - invited longtime fans to become marching music evangelists. Chris Ortleib of Glassmen baritone line (1998-1999, a volunteer from 2000-2002 and a "fan for life," sent in this one. "Attached you will find a photo of me, on the right, and my girlfriend on the left at the Columbus, Ohio, show on Aug. 1, 2005, in front of the Glassmen's souvie trailer. She never marched drum corps, and had never heard of it, let alone been to a show. 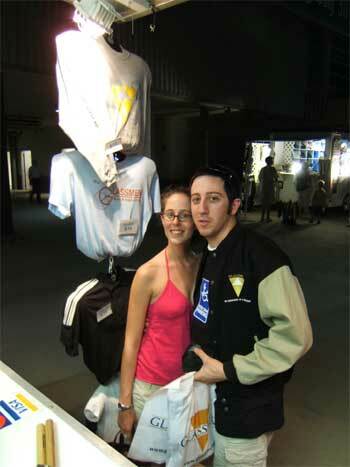 I took her to the show as our first true date, and secured another convert for drum corps." Thanks Chris! We're asking each of you to reach out and spread the word about the drum corps activity. Knock on doors, e-mail, instant message, even yell if you have to -- but this is the summer for you to bring a friend to a DCI show. Bring a digital camera to the show and take a picture with your new drum corps convert at the show, and send it to dave@dci.org -- we'll post pics as they come in under the headline, "New convert." Great seats are still available at most DCI shows. Pick up the phone, make your pitch, and we'll see you on the 50.